Don’t ever do this. Never. Ever. Please. 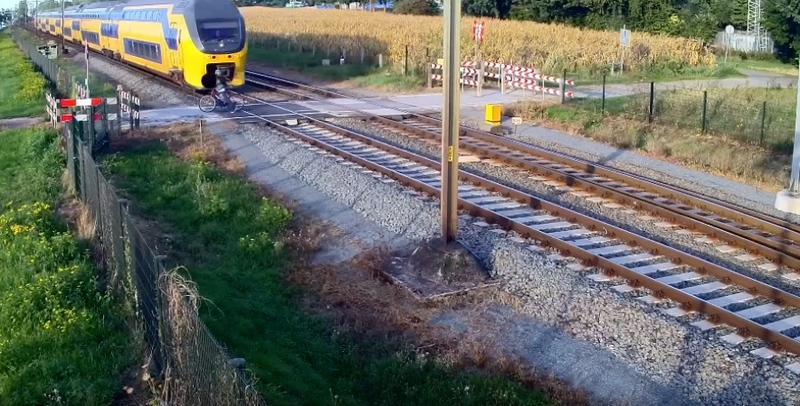 Talk about lucky to be alive… Check out this insane video from a railroad track security camera in the Netherlands. Not sure what this guy was smoking, but he somehow missed the passenger train speeding his way at Mach 1 when he decided to casually roll across these train tracks. In the video you’ll see that he does stop for a passing freight train that’s not going nearly as fast. But somehow he forgot to look the other way, and instead jumped back on his townie and started rolling. Then about halfway across he clearly realizes that the Grim Reaper is at his door and starts doing his best Pee-wee Herman skateboard kick. Fortunately those shoes had some traction and he just manages to clear the tracks. Our very unscientific pause-play-pause-play analysis of the video indicates that he missed certain death by about 8 feet or 0.000001 nano seconds. However, we have no information on the condition of his underpants after the incident. ProRail is engaged in a battle to lift all unguarded crossings in the Netherlands. Unfortunately, this sometimes takes a long time in connection with all kinds of conversations that have to be conducted behind the scenes, for example with local residents, municipalities, provinces and other parties that have an interest in such a level crossing. Often others want to keep an unguarded crossing, because it is an important crossing for them. A frequently heard argument for maintaining this kind of consideration is that people “can look after themselves.” Unfortunately, we see other signals in practice, as can be seen here on the video. Check out more vides on RoadBikeReview.